Mountains in Kenya offer easy or challenging ascents with spectacular scenery. Wild animals and birds are in abundance and you might even spot some rare or endangered species. Straddling the equator and standing at 5,199 meters high, Mount Kenya is Africa’s second highest mountain after Mount Kilimanjaro (5,895 m) in Tanzania. The mountain’s highest peaks are Batian (5,199 m), Nelion (5,188 m) and Point Lenana (4,985 m). Batian and Nelion can only be reached by technical climbers, whereas Point Lenana can be reached by any fit trekker. Mount Kenya is the source of the name of the Republic of Kenya. The Kikuyu people live on the lower slopes of the mountain and believe the mountain is the realm of God, Ngai or Mwene Nyaga. They call the mountain Kĩrĩ Nyaga (Kirinyaga), which translates to place of light. 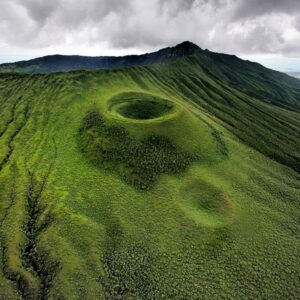 Mount Elgon (4,321 m) is an impressive extinct shield volcano located on the border of Kenya and Uganda. It’s one of the largest intact calderas in the world. The peaks shelter a series of warm geothermal springs by the Suam River. The area surrounding the mountain is protected by two Mount Elgon National Parks one on each side of the international border. Wild animals that can be found here include elephants, buffaloes, Black-and-White Colobus monkeys, Blue Monkeys, hyraxes, hyenas, duikers and bushbucks. More than 300 species of birds have been recorded including the endangered Lammergeier, African Goshawk and Baglafecht Weaver. The mountain makes for an interesting trek, as it supports a rich variety of vegetation ranging from montane forest to high open moorland studded with the giant lobelia and groundsel plants. 400 tree species have been recorded in the area. The highest peak of the mountain on the Kenya side is Koitobos (4,222 m) and the highest peak on the Uganda side is Wagagai (4,321 m). Trekkers can easily reach Koitobos Peak in about two hours from the road’s end. Mount Elgon has many caves the most famous being Kitum, which is more than 60 meters wide and penetrates 200 meters. Each night herds of elephants gather at Kitum Cave and begin a slow procession deep into the mountain. They make their way through the caves, following well-worn paths made by generations before them. Deep in the cave, they use their tusks to break off pieces of the cave wall, seeking the natural salt, which they chew and swallow. Witnessing this incredible sight is just one of the many attractions of Mount Elgon. It is a stratovolcano located southeast of Lake Naivasha in the Great Rift Valley, 60 kilometers northwest of Nairobi (the capital of Kenya). Mount Longonot stands at 2,780 meters high and has a large 8 x 12 kilometers caldera formed some 21,000 years ago. It is thought to have last erupted in the 1860s. The mountain is part of Mount Longonot National Park. A trail runs from the park’s gate up to the crater rim, and continues in a loop encircling the crater. It takes about two hours to reach the peak. A forest of small trees covers the crater floor, and small steam vents are found spaced around the walls of the crater. As you climb the slopes, you are met by spectacular views of the Great Rift Valley and Naivasha below. Wildlife that can be seen include hartebeests, zebras, giraffes and buffaloes. Other mountains in Kenya are; Mount Homa, Mount Kinangop, Mount Kipipiri, Korosi, Mount Marsabit, Menengai, Mount Mtelo, Namarunu, Mount Ng’iro, Ol Doinyo Eburru, Ol Doinyo Orok, Ol Donyo Sabuk, Olkaria, Paka (volcano), Rotundu, Mount Satima and Suswa. If you’d like to climb / trek any of the mountains in Kenya, the best way is to take an organized tour. See my page on safaris in Kenya to be able to contact my recommended tour operator.